Oh to a be a Marine in space. 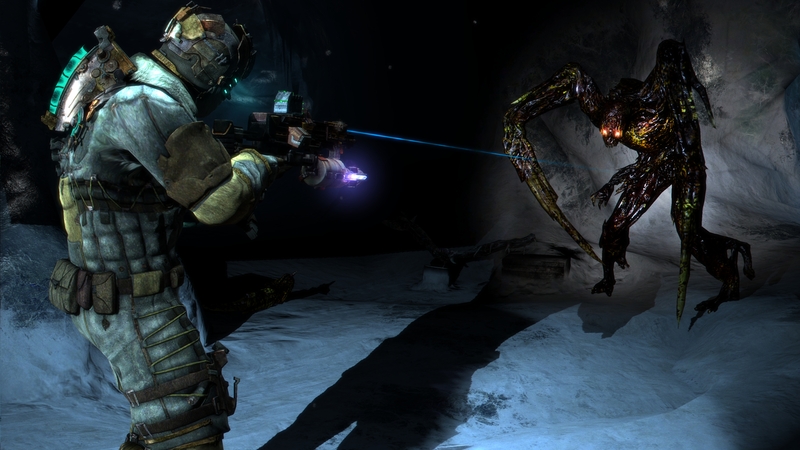 Relic’s Warhammer 40K: Space Marine appears to be suffering the same fate as the original Dead Space and Platinum’s Vanquish. Even after a salvo of positive reviews (76% meta-score) and good word of mouth, these games all got buried by the avalanche that is strict competition. After sitting down this weekend and playing the heck out of Space Marine, I have to say it was an incredibly good time. Pedigree: Warhammer 40k: Space Marine was created by the fine folks at Relic Games, best known for their groundbreaking RTS titles (Company of Heroes). Sadly Relic doesn’t always get the respect they deserve despite the fact that they make some pretty incredible AAA titles. The problem lies not in programming prowess or game quality, but people’s inability to accept that some things in the universe are just similar. 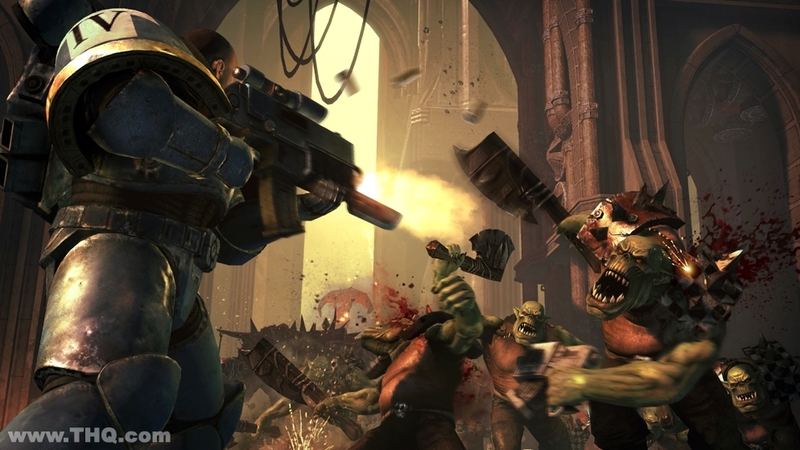 For instance, folks may take one look at Space Marine and say that it’s a Gears of War ripoff despite that fact that the 40K universe predates Gears of War by about 30 years. The folks at Relic bring a ton of ingenuity and polish to the crowded shooter market and manage to create an incredibly solid title for us nerds to enjoy. 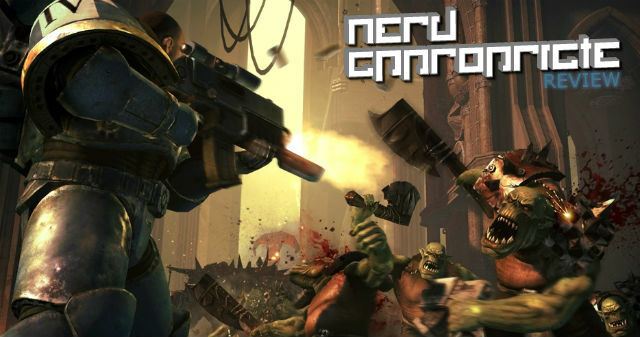 The Story: The world of Warhammer 40K is a dark fantasy universe in which orks, elves, dwarves (squats! ), and humans all still exist. Mankind is run similar to the Roman Empire and lords over vast imperialistic land holdings all over the universe. There are a ton of factions that exist within the 40K universe, the bulk of whom are in a constant state of war. The best of the best, The Space Marines, are much like the Spartans of old, bred for battle and ready to die for the cause. Space Marine follows the adventures of Captain Titus of the Ultramarines on a near-suicide mission to stop a colossal (millions!) Ork army from seizing control of an all important super-weapon. Orks in this universe are quite similar to the “orcs” of old, only with access to rudimentary steam-punk esqe technology. Oh yeah, they also have thick British accents… “More work?” Within a few minutes of playing I noticed how incredible the environments and animations were within the game. There are many moments in which Titus and his small squad of Space Marines arrive in an an area in which the Orks have already done their damage. Imperial soldiers lay broken and screaming in hospital beds, and corpses litter the nasty trenches. There is not an ounce of humor or joy in any part of this game… war is indeed hell. Nice work Relic. The Characters: Sadly,Ultramarines aren’t known for their charisma, and the narrative has little to offer in terms of character development. Captain Titus is a noble and honest warrior who wants nothing more than to complete his mission for the Emperor, and that’s pretty much it. While he travels with two other Marines, they often have very little to say during cut scenes and exhibit no real emotion. 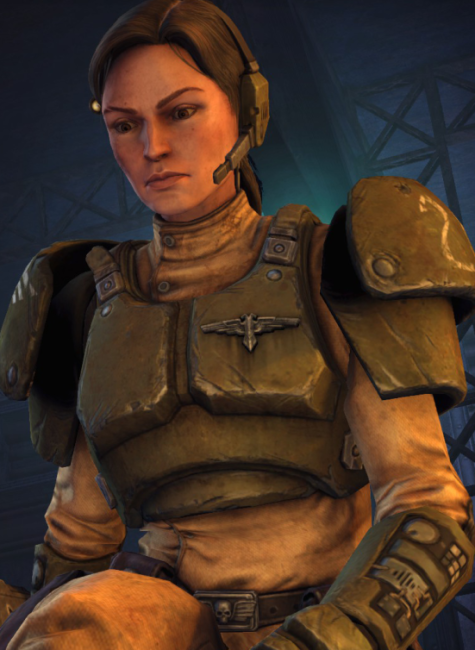 At first, the sterile nature of the characters bothered me until the Marines encountered a female Imperial Guardsman by the name of Lieutenant Mira. Mira, while still serious, reflected the fact that Space Marines are bred to be emotionless instruments of the Emperor. I should also add that there was something incredible about seeing the hulking armored soldiers standing next to an average female that really showed off their strength and bulk. I grew to like Titus and Mira, but I really wish that other marines had more time to shine. The Gameplay: I was immedietly impressed with how seemelessly the gameplay shifted from ranged to melee combat. Using the left trigger you can control a variety of weapons, all fun, to decimate the Ork hordes that constantly block your path. Your X and Y buttons unleash a series of melee attacks that can be chained into combos depending on which melee weapon you have equiped. If you can imagine a less refined version of Gears of War combined with a simplified Darksiders, you now fully understand how this game is played. While Titus has regenerating shields, it’s his health that you really have to watch. 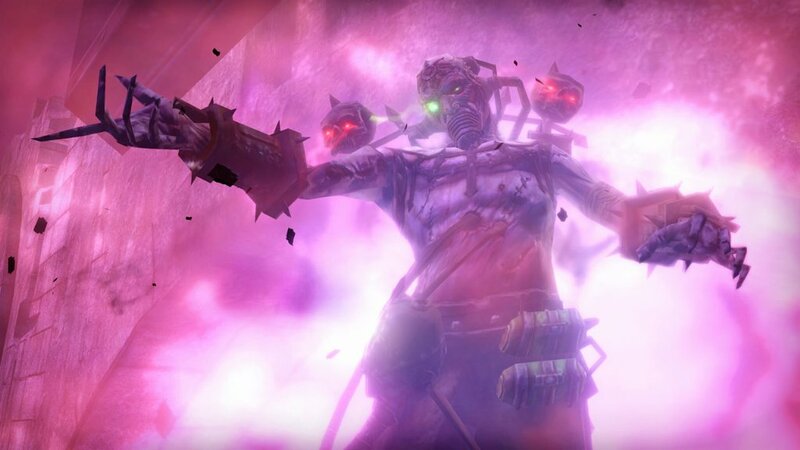 Performing an execution on a stunned enemy unleashes a well animated takedown that restores a bit of health. I found myself weakening the approaching enemies with weapon fire until they got into melee range where I then unleashed my inner space ninja on their faces. 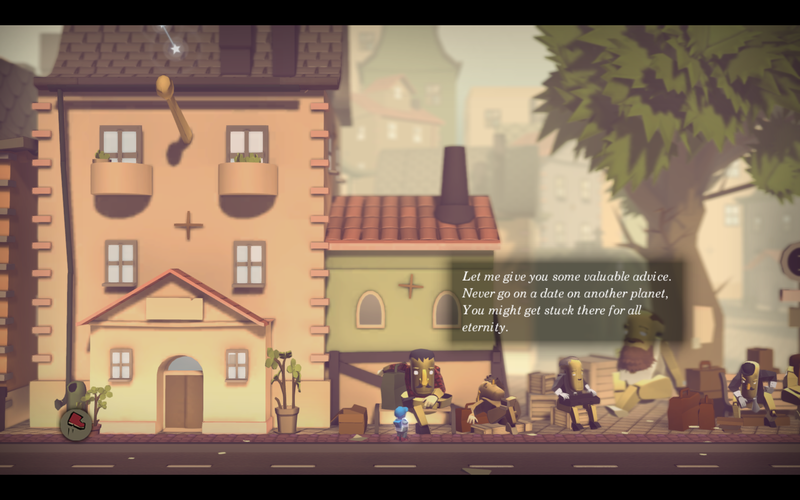 While there are no skill trees (a shame) to speak of, there is a super bar that enables you to unleash a few tricks when the going gets rough, specifically a health recharge as well as a time slowing maneuver. Gameplay was satisfying and the overall “feel” of the system was great. Multiplayer: Warhammer 40k Space Marine’s multiplayer oddly reminds me of the frantic, and overlooked, Transformers: War For Cybertron. Like most modern shooters Space Marine allows you to fully customize your own marine using an insane combination of armor pieces, perks, and weaponry. I believe I saw that there are over 1.8 billion combinations, meaning that you’ll never get bored of tweaking and modifying your character. Currently there are three character classes and two different game modes. While mutiplayer is a lot of fun, Warhammer suffers from limited maps as well as some balancing issues. One class in particular, the Assault Marine, tends to dominate the battlefield and nearly one-shots players while using a certain perk/weapon combination. Also, Space Marine currently only boasts 5 multiplayer maps, some of which are bland and unexciting. After only a few hours you may find yourself saying, “not this map again“, which isn’t a good thing. However there is good news on the horizon, a free “horde” mode is said to be coming in early October as a thank you to fans… Bring it on! Nerd Appropriate? While the single player campaign only clocked in at around 8 hours I found myself incredibly impressed with the game overall. 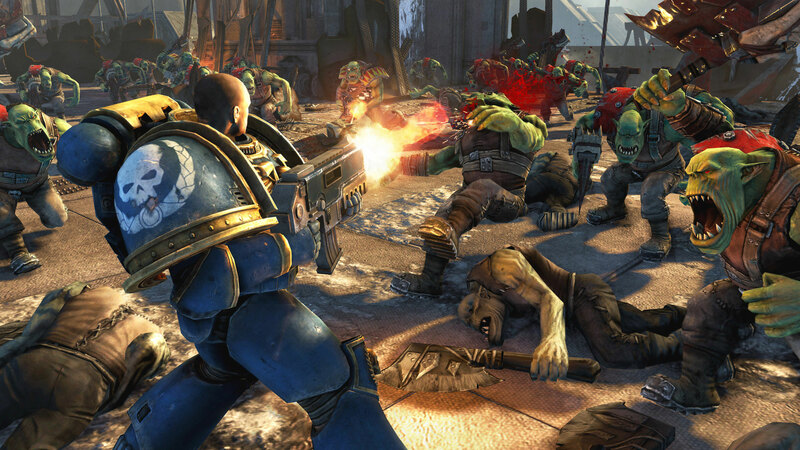 Warhammer 40k Space Marine is an entertaining action romp for those of us counting the moments until Gears of War 3 hits shelves. 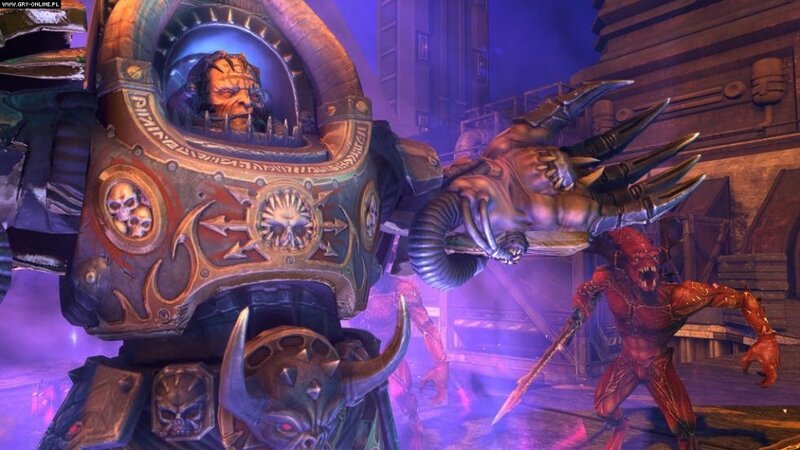 Hopefully with the addition of co-op in October, Space Marine will get the respect it deserves. 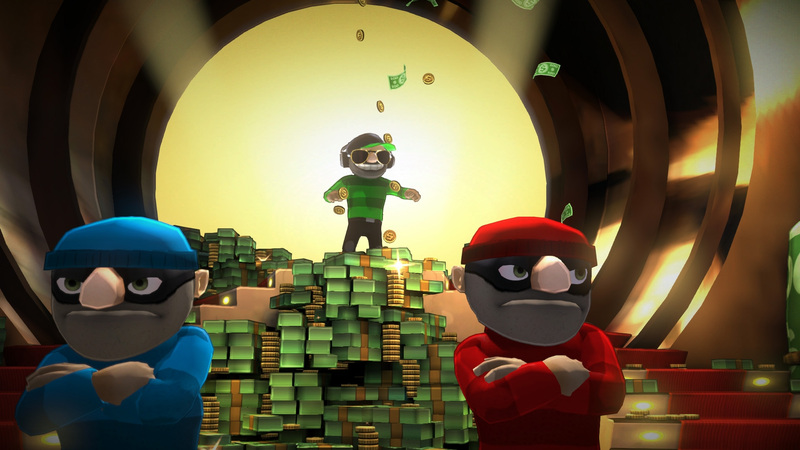 Comic hijinks abound in the frantic multiplayer thivery of Dollar Dash, available now! I feel like there wasn’t a hole lot of buzz generated for this game. But, not being a fan of 40k, I didn’t exactly seek this game out either. Still, I’d be interested to see what it has to offer. It looks like a ton of fun. As an aside, something that I think needs to stop in the gaming world are developer walkthroughs where spectacular scenes and action are rendered lifeless by the commentary of a guy who has been looking at the game for the past 20 months of his life. I think there’s a marketing balance somewhere in between this and quick cuts of your game set to Nu Metal. Scott, I think you might actually enjoy Space Marine. Even if you have little exposure to the 40K universe I think the game does a great job of introducing the tone as well as a handful of the various factions. You can borrow my copy in a few weeks. In a few weeks when the “ground aliens” emerge? I think some of my favorite set pieces in the game were when you were just walking among the Imperial guardsmen in the bunkers. It did an excellent job of creating the sense of awe a “citizen” would experience seeing a Space Marine. I can’t wait for the co-op, hopefully this game won’t be completely swept under the carpet by the “ground aliens” this upcoming week…..
Sessler’s Secret to Getting A Job In The Game Industry – Must Watch!